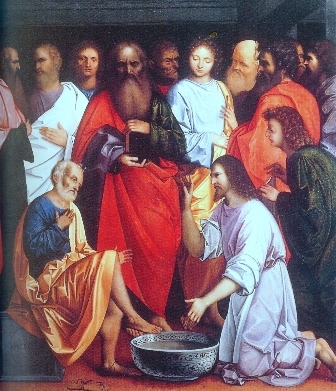 CHRIST WASHING THE DISCIPLES' FEET - JOHN 13.1– 20. Saying ‘This is my body. more significant than washing dusty feet. ‘Do you know what I have done? I, your Master have washed your feet. This is my example unto you. Blessed are the ones who do this.’ M.D. Almighty God, Your Son Jesus Christ has shown us what service is all about, teach us that what we do for the least of our brethren we do also for You. Give us the grace to be the servant of others as You were, even when You died on the cross for us. Amen. 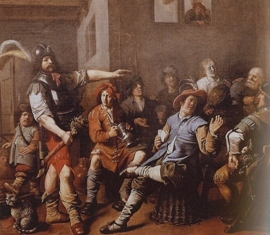 This painting is by Jan Miense Molenaer of the 17thC. Now in the Museum of Fine Arts, Budapest..
During the Last Supper Peter had very vehemently told his Master that he would never desert him. Here he is just as vehemently denying he knew Christ, or that he was His disciple or that he was a Galilean. Abuse and insults in dignity. Were you brought to yourself. Or was it fear of death? only a few hours before. Without Your grace, we are very fragile dear Lord, and we can so easily deny you as Peter did. Give us your strength to be bold in proclaiming that you are the Lord of the cosmos who died to restore all to its former glory. Amen. This is by Fra. Angelico, a Dominican of the fifteenth century. It is one of many paintings he did for the Dominican St. Marco monastery in Florence. Pilate handed Jesus over to the soldiers to their usual brand of brutality, hoping this would satisfy the demands of the Jews. 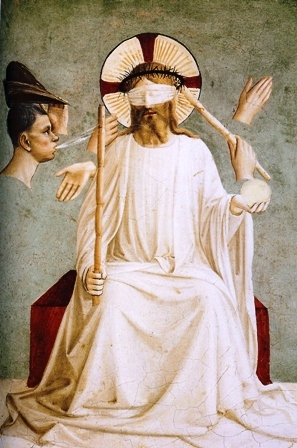 Part of their violence was to mock Jesus, and so He was blindfolded after having a crown of thorns placed on his head, a sceptre put into his hand and robed in a purple gown. The Jews sought Your death, O Lord. They did not want to know who You are. in the garden of Gethesemane. to Pontius Pilate, the governor. “What is the charge?” he asked. “Blasphemy.” He has made himself a king. A king! So you are a king. my kingship is over souls. Yet my authority with my Father is ov’r all. Your authority comes from Him. Without that you can do nothing. “Crucify! Crucify Him,” they screamed. A death Pilate assented for You, my Lord. Pilate refused to acknowledge Truth when it was before his eyes, teach me to acknowledge You as the truth, the way and the life, dearest Saviour. Amen. This is a painting by Hans Memling in the 15thC, now in the Museum of Fine Arts, Budapest. 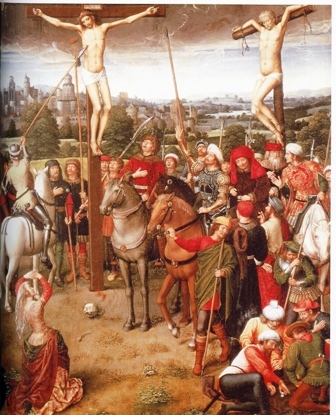 The Roman used their spear twice during the Crucifixion. Firstly to offer Christ the soaked sponge of vinegar, and secondly to pierce His side to make sure that He was already dead. On piercing His side outflowed both water and blood that in the words of St. Augustine became “the twin sacraments”. Who is able to endure your suffering dear Lord? And hoisted so high, so high on your cross. Every part of Your still panting body. You know this is Your victory over evil. You are indeed the King of the Jews. as you lived so you die in obedience. The sin of man has been expiated. You die so quickly, no struggle for you. It is Your life offered to the Father. In loving service rendered for man. Still flowed in that stream of blood and water. bathed in Your fountain of blood. M.D. This is a painting by the van Eycks brothers in the 15thC. It hangs in the Museum Boyman-van Beuningen, Rotterdam. 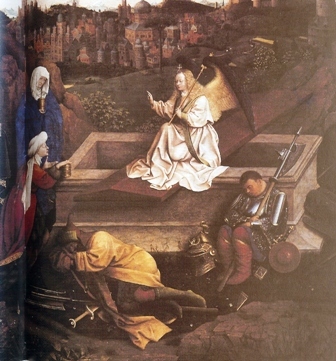 It a painting faithful to scripture, showing the guardian angel, guards, the three women (though one missing in this scaled down version of painting). However the tomb itself does not reflect scripture or mid-Eastern traditions as a cave dug out of a hillside; instead it is depicted as a sarcophagus. and place you gently in a tomb. Who raised Lazarus from the tomb? But who will roll the stone away? As we rest with You in the tomb dear Lord, may we also rise with You in that newness of life that comes from your glorious triumph over death. Amen.